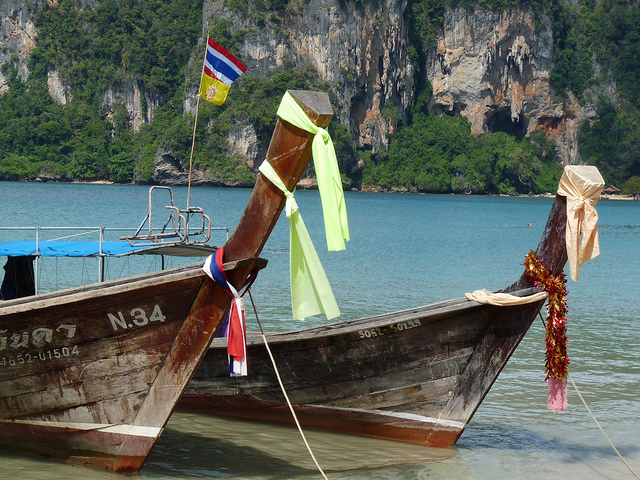 Thailand ends on a high, azure seas and picture postcard beaches – I am in hell | Hand Luggage. 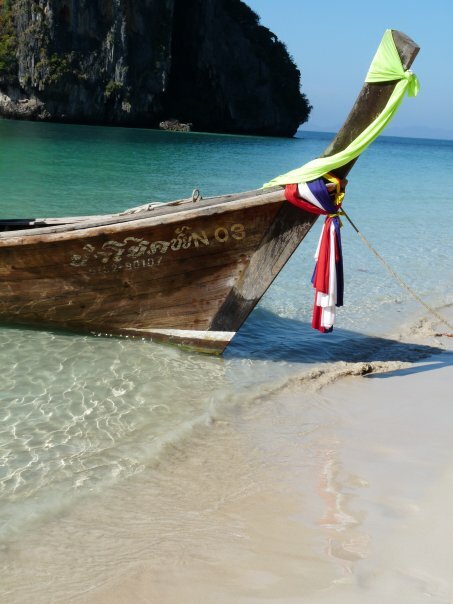 So after the serenity of the old capital, the mania of Chinatown, the sobering WW2 reminders and the swim down the river Kwai, we had to end our holiday in typical style, on one of Thailand’s many idylic, gorgeous, perfect, pristine, baking hot beaches. 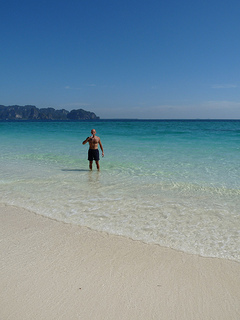 We stayed in Ao Nang, Krabi. A nice little town that has easy access to some of the most picturesque azure waters and white sands. The area is renowned for its impressive karst formations that jut out of the sea as well as its”hongs” – caverns in the rocks that you can canoe through. Sadly for me, a combination of 36 degrees and no shade to be seen for miles = hell on earth!!! 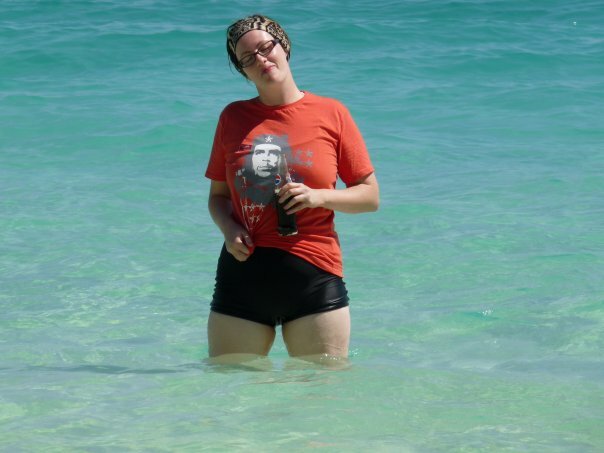 As I watched a seemingly endless parade of perfectly proportioned, honey golden, waif like women parading in their perfectly fitting string bikinis with not a pimple of cellulite to be seen, how I sulked, sun burnt, heat rashed and in the most unfortunate all in one swimsuit known to mankind . .
Not really a bathing beauty . . . . . . . It is about ten minutes walk to the beach along the main street crammed with shops, bars and restaurants. Set in a lovely garden, backed with magnificent mountain views. It’s a brilliant place, would definitely recommend! 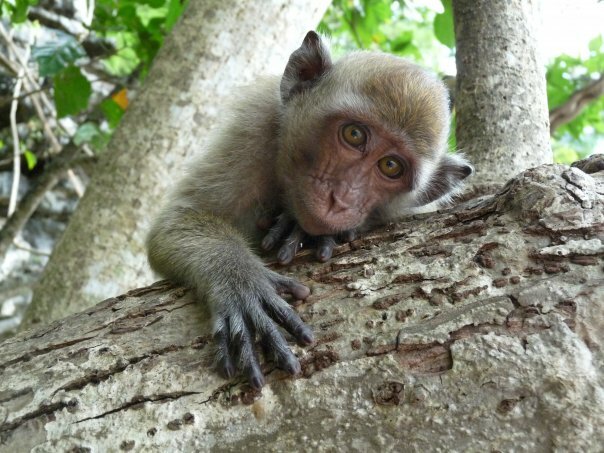 The main beach at Krabi has some inquisitive, hungry little locals . 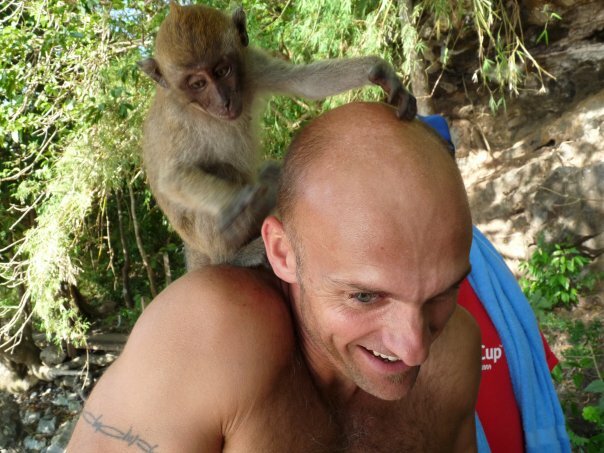 . .
Neil gets a close up call from one of Krabi beach monkeys! But they are soooo cute!! 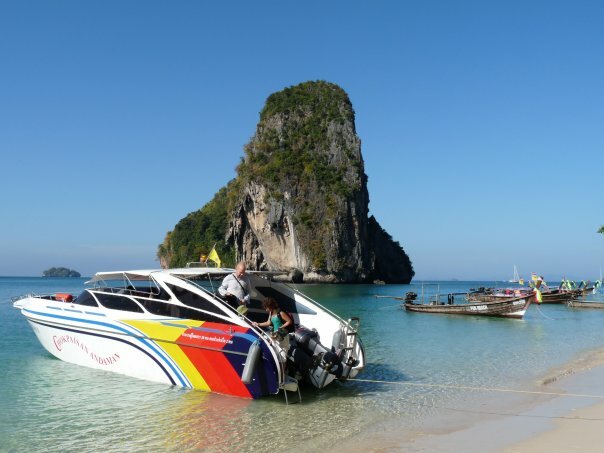 We took a speed boat trip to several of the islands off Krabi, including Railey beach, Chicken Island and Poda. 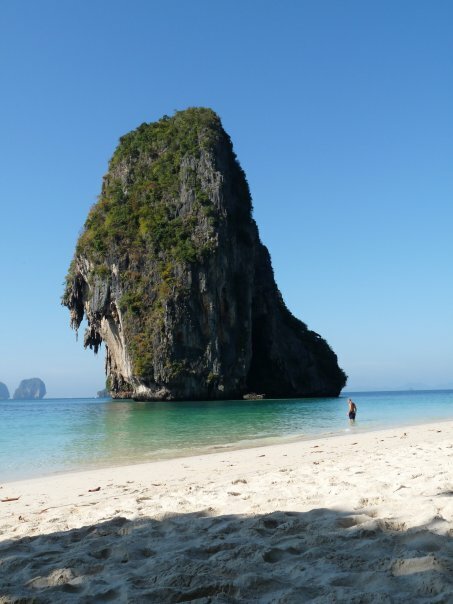 We also checked out Phra Nang where the James Bond film Man with the Golden Gun was filmed. All in all a lovely, albeit too hot for me, end to our first experience of Thailand!!! Italy, sullen, smelly and strikes! !